A pioneering report calling for an independent audit of Shari’ah compliance in Islamic finance will be launched today at the Global Islamic Economy Summit in Dubai. Following consultation with over 35 practitioners across four countries the Islamic Finance Council UK (UKIFC) and International Shari’ah Research Academy for Islamic Finance (ISRA) unveiled the ‘External Shari’ah Audit Report’, which seeks to strengthen Shari’ah assurance and calls for external Shari’ah auditing to be made mandatory in Islamic financial institutions across the globe. With consumer and regulatory demands increasingly focusing on trust, transparency and accountability corporate governance has become a critical challenge for all financial institutions. In particular, this trend has shone a light on Islamic financial institutions, where in-house boards of scholars effectively self-regulate Shari’ah compliance, raising questions as to whether the current model of governance is fit for purpose. The report, which reflects recent developments in international policies and regulation, proposes that external Shari’ah audit, requiring Islamic financial institutions to undertake an annual Shari’ah audit by a competent independent party, should become an essential development for the industry to augment the work currently done by Shari’ah boards. 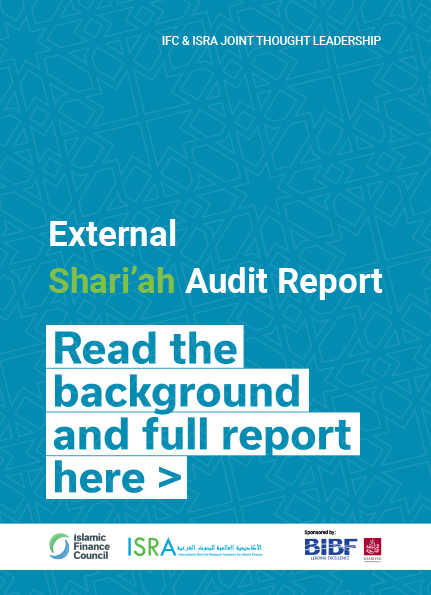 The report also provides a jurisdictional analysis of current external Shari’ah auditing requirements in Oman and Pakistan, where it has already become mandatory. The report also focuses on implementation issues, providing specific recommendations on the role of central bank Shari’ah boards, requirements for public reporting, qualification of external Shari’ah auditors and the need for a professional body for Shari’ah scholars in Islamic finance. The UKIFC is a specialist advisory and development body focused on promoting and enhancing the global Islamic and ethical finance industry. The organisation was launched in 2005 by a group of likeminded professionals who sought to make a contribution to the development of the Islamic finance industry. The UKIFC specialises in four core areas, being:1) Ethical finance – helping to promote better co-ordination and understanding of the shared values between Islamic finance and the broader ethical finance arena; 2) Advisory – specialist capability in advising government agencies, regulatory bodies and financial institutions on creating enabling frameworks for Islamic finance; 3) Executive training – delivering bespoke capacity building programmes aimed at practitioners and regulators focused on commercial issues; and 4) Thought leadership – authoring reports, community education and providing industry comment towards influencing regulation and encouraging the development of the sector based on strong research and insights. ISRA is an autonomous body set-up under the direction of the Central Bank of Malaysia (Bank Negara Malaysia) to promote applied research in the area of Shari’ah and Islamic finance. ISRA contributes towards strengthening human capital development and provides a platform for greater engagement amongst practitioners, scholars, regulators and academicians via research and dialogue, in both the domestic and international arenas. Through pioneering research and rigorous intellectual dialogue, ISRA aims to promote innovation and dynamism and thus extend the boundaries of Islamic finance.